over AC Milan in the Champions League final. Dudek copied Grobbelaar's antics during a penalty shootout in the 1984 European Cup final against AS Roma. Both times the Milan players were unsettled by the goal line antics -- Dudek saved two penalties and another was missed. "Jerzy did Liverpool proud," Grobbelaar said from South Africa. "He saved two penalties, you can't ask for more than that. "I didn't expect it (the wobbly legs routine). He did it very well." 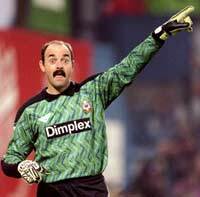 Grobbelaar played 627 games for the club in 13 years, claiming six league titles and the European Cup in 1984, the last time the Reds had won the trophy before Wednesday night. Known as the 'clown prince' of English football, Grobbelaar was asked by Liverpool manager Joe Fagan to put off the Roma players during the shootout after the 1984 final ended 1-1. His wobbly legs on the goal line caused Francesco Graziani to miss his kick and Liverpool won the shootout 4-2. Grobbelaar watched Wednesday's game with friends at a golf club and he was staggered by Liverpool's comeback from 3-0 down to draw 3-3 after extra time. "It must be the finest comeback in European Cup history, at 3-0 down they were dead and buried. To score three goals in six minutes is quite remarkable," the former Zimbabwe international said. "Tell me any Latin team that has been strong under pressure? They (Milan) rested on the laurels, they thought they were home and dry but you are never home and dry in football. "It's not over until the lady sings and there was only one voice last night and that was Liverpool's."